How many of you have built a Cedar strip canoe? I am going to purchase the plans for the 15' Ranger on Sunday night from Bear Mountian boats. I just wanted to get some feed back on your experiences. 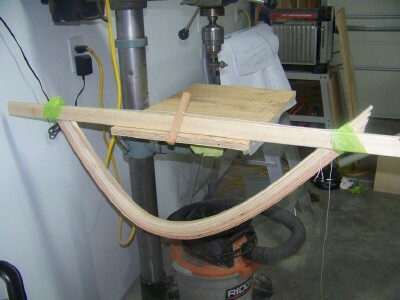 I have wanted to build a wooden strip canoe since I was a teenager and helped a old family friend finish his it was a thing of beauty. Last edited by Bert304 on Sun Aug 30, 2009 3:53 pm, edited 1 time in total. You are going to learn more about canoes than you ever wanted to know!!! We have several who have built more than one. I think there are several things in "HOW TO" You will just heve to do a little research down there. Just check back soon, I'm sure someone will be along to help....I sure can't. I just talked to one of the people at Middletown lumber over near Harrisburg PA. They have the Clear Cedar that I need for the Canoe. I will have to mill it my self. I do not see that as being that hard, I just have to get a bead and cove bit. Might get a rip blade for my TS. I have to drive out there on a Saturday and check out the WRC that they have. I see the canoe bug has take down (I mean bitten) another man. Welcome to the club and you must bring your own groaning chair. (the groaning chair is mandatory equipment for getting you out of a sticky spot). You most definitely will want a decent ripping blade for milling your own strips. Bead and Cove though is an elective. I've built one canoe with rolling bevel and started a second one for me and the Mrs. But yes a decent table saw and a decent blade and a known good method for ripping pass after pass with repeatable accuracy. But you can do it. The link here is to our main webpage and a sublink will get you to the "38 Special" which is a solo camping tripper we made for Chris' graduation present. There's a couple other builders on the board here. We'll be glad to help out anyway we can. If you have not done so already BUY the latest copy of Ted Moores CanoeCraft put out by Bear Mountain Boats. They also host a VERY good Q&A forum specific to strip builders. 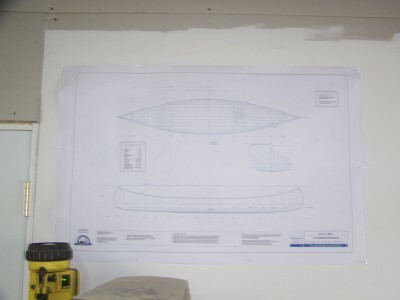 Come on board to the Bear Mountain Boats Forum - there are a LOT of builders who can help you and who have built that canoe! I am also on Bear Mountian Forums as Bert304. I had the 1st edition of Canoe craft for several years and I bought the newest verison a 2 years ago. This has been an on going dream of mine for 20 years or so. I bought the plans for the 15' Ranger. I am going to get 13 copies of the station molds made once I do the flip and recenter it. I plan to put a copy of the mold on each one of the stations. I am trying to figure how many boards I would need including the waste from the saw blade to get the correct number of pieces. 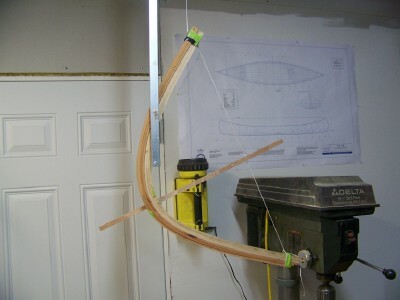 I think I am going to make the Stems out of Cherry and White Birch. I think I am going to alternate the Cherry with the White Birch. I am going to test it first to see if I like it. 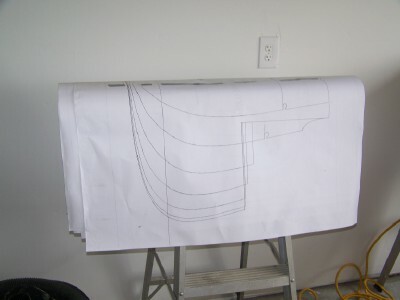 Woodstrip canoes take a fair amount of time, but they are actually pretty good projects to learn on because every mistake that can be imagined has been made by someone and fixed. You can wind up with a beautiful boat. When I built my first one in about 1972, it was the cheapest way to get a canoe. That's no longer true, but they are stunning to look at, and it's hard to stop at building just one. You can do it with a variety of tools. 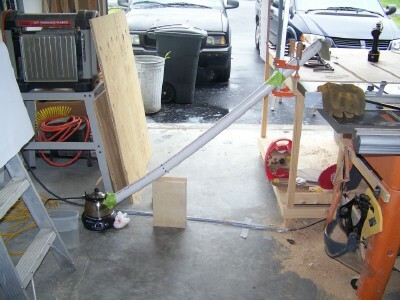 A good tablesaw is very useful but is not needed. 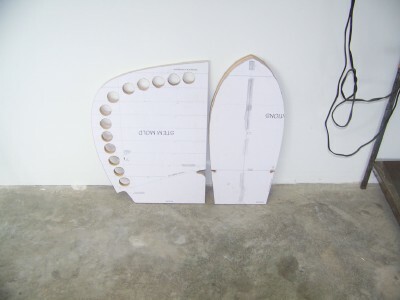 My website describes a good way to cut strips with a circular saw. My website has a lot of links to other sources of info, but is not really up to date. But do check out John Michne's website. I REMEMBER BUILDING ABOUT 500 OF THESE CANOES. FULL SIZE MANY YEARS AGO. 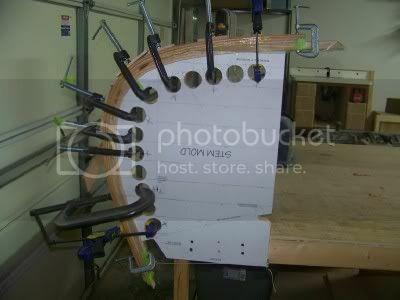 I HAD 5 FORMS SET UP, ONE GUY TO TABLE SAW THE STRIPS AND BEAD AND COVE THEM AND TO OTHER GUY WITH A DUO FAST AIR STAPLE GUN GOING 10 TO 15 HOURS A DAY 7 DAYS A WEEK. Well here is an update on the progress of my 15' Ranger. I started to cut the molds. So far I have the Stem molds cut and station #6 cut and ready. I cut my stem material and I have the first stem on the mold drying. Here are a few pics of my progress. I am trying to take my time and check everything twice. I guess this is my canoe blog. The stem material is inside stems are pine ( no one will see them anyway) Out side stem material is Cherry and Birch They are cut to 1/8 and layered 3 Birch and 3 Cherry. I have a picture of that when I take them out of the mold. See "Stem and Station 6 molds"
See "Steamer set up including wifes tea pot"
See "Ranger stem mold ready to have the stems bent"
yer off to a good start there Bert. Have you built your strong back yet? No not yet Because it takes up alot of room. 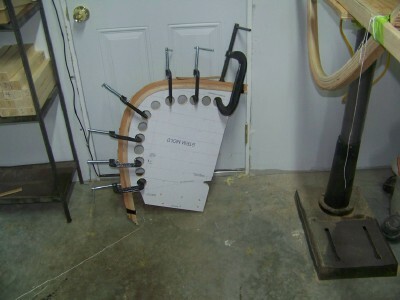 Once I am finished making all the Station molds, I am going to start building the strong back. My garage is only 19 X 19 feet so I have to put it 3 feet from the wall and that chews up alot of room. I have to push most of my tools on the other wall. See "Stems in the mold"
Station 5 is 24 1/2 inch long and 4 thru 0 are 25 inches and higher. Last edited by Bert304 on Thu Aug 20, 2009 5:17 pm, edited 1 time in total. That's why most of use Photobucket, or some other off-site storage facility. www.photobucket.com Free, easy to use. After you upload a picture to it, hold your cursor on the picture and a pop-up appears with four URL's. Copy and paste the last URL into your post, and the picture will appear in your post. Easy--even I can do it!!! No affiliation with them--just a satisfied user. And, I want to continue seeing your progress!!! Another vote for Photobucket. Looks like you're doing everything right so far Bert! You're off to a good start ... good luck with the project. I have plans for a canoe, but my first build was a Bear Mountain kayak ... the Endeavour ... great fun building it and even more fun paddling it. Here is an up date of my stems. I cut several Cherry and Birch 1/8 thick and I have them glued and drying on the stem mold. Yup - you're doing fine Bert. What kind of glue are you using for the stems? Some guys will tell you it has to be a waterproof glue since it the outer stems etc. 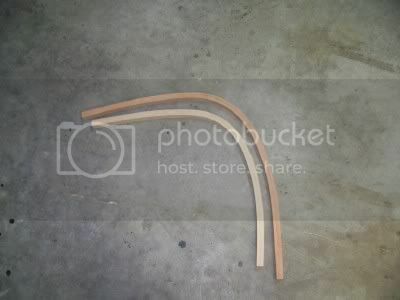 Use any wood glue for the stems and your strips. It makes no difference since it's all encased in fiberglass, epoxy, and varnish. There WILL be some spring back in your bent strips so don't be alarmed. After they come off the steam bending forms, just tie them with say butcher's string to the desired shape to keep them from springing too far. Other than that - shoot - you're nailing it. Good work. Edit: Hey I got a trick for you to mark the center 1/8" of those stems for a beveling mark. Don't try to draw a centerline down the middle, you might hit it accurately and might not. I planed ever so slightly the glue etc from the side of those stems and made them nice and FLAT. I padded a fine tip "Sharpie" pen and laid the glued up stem flat on the workbench and drew a line on the stem with the padded pen flat on the workbench. 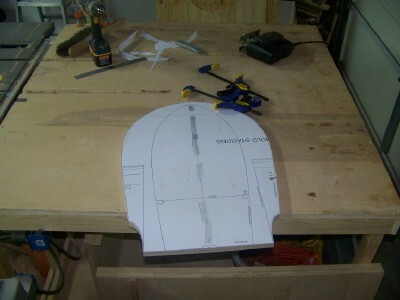 Padding the pen and laying it flat on the bench will raise it up closer and closer to the centerline of the stem. Clear shipping tape is your friend for padding this. It took some experimenting with finding the thickness needed but when I was done with one side I simply flipped the stem over and did the other side. Viola! an 1/8" center marked consistently all the way down the center of the stems. I have only been using Titebond wood glue. Thanks for the tip with the Sharpie I will reread that when it is time for that. 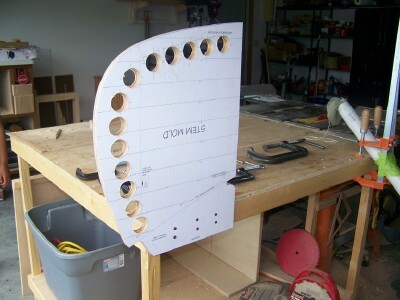 I have been makeing the stems a little wider and running them thru my surface planer.